In a typical dry desiccant system, the desiccant is mounted on a rotating wheel. 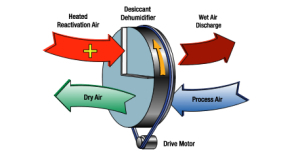 As the wheel turns, the desiccant passes alternately through the incoming process air where the moisture is adsorbed and through a “regenerating” zone where the desiccant is dried and the moisture expelled. The wheel continues to rotate and the adsorbent process is repeated. Typically, about three-fourths of the desiccant wheel is exposed to the incoming air throughout the process. During regeneration, the desiccant is heated by a direct-fired gas burner or indirect-fired water or steam coil. Air to be dried. May be outside air, inside air or, more commonly, a mixture of air with high humidity content. Air is dried by desiccant wheel. May be cooled, filtered or otherwise handled. Relative humidity is substantially lower and temperature slightly raised. Air flow, usually outside air, that drives moisture off wheel. Reactivation air is heated by direct-fired gas burner or indirect-fired water or steam coils. Hot, wet air from wheel is exhausted outside or passed through an air-to-air heat exchanger. Using a heat exchanger to preheat incoming process air offers substantial savings in northern climates. Like a dry desiccant system, a liquid desiccant system relies on the ability of certain materials to absorb moisture from air. In a liquid system, the moist incoming air passes over a high-surface area medium containing the liquid desiccant solution, usually lithium chloride. As the moisture absorbs into the desiccant liquid, the diluted lithium chloride solution flows to a heat exchanger where the heat from a gas-fired burner removes the moisture, reconcentrating the solution. The regenerated desiccant solution then flows back to the medium for re-use.